Everything works in cycles, even comic books. The Dark Age of the 1990s seemed to have no equal in that cycle, however. Pouches, guns, more pouches, and grizzled men and women gritting their teeth like they were constipated knew no bounds in the early 1990s. One of the people who helped bring in this phenomenon was Rob Liefeld, co-creator of Marvel character Cable and X-men spinoff X-Force. While the Dark Age of Comics has fallen away and characters like Cable and the X-Force have matured into complex concepts, many people look to Rob Liefeld as some kind of remnant of the era. However, Rob has been evolving as the years passed with experience and age. Does his art hold up in this more nuanced modern day? What about his writing? His new book, Major X, will let us know. Rob Liefeld takes the job of writer, penciller, and even inker. Adelso Corona and Dan Fraga help with the inks, while Romulo Fajardo Jr colors the pages. Joe Sabino also provides the letters for the book as well. The story opens with Major X having wiped the floor with X-Force, circa 1991ish. Domino and Shatterstar are out, and Cable is just barely holding his own. Major X is proving to be a formidable opponent, and his friend M’Koy is more than capable of holding his own in a fight. A flashback takes the reader into the past to show Major X driving a cool futuristic motorcycle around before cutting back to the present for more fighting with the biggest names in 90s comics. Who is Major X? What is his deal? The answers may surprise you. Rob Liefeld’s craft is remarkably iconic, for better or worse. His art has improved dramatically since his early days and is still just as charged with action and motion. Men are beefy and thick with muscle and women… well, Domino shows up in one panel, knocked unconscious and in the background for another. Maybe Rob Liefeld wanted to focus on the manly men with their pouches and claws and metal rather than women, with whom his art has historically had more issues. It’s great seeing now-retro designs from the early days of Liefeld’s X-Force and Jim Lee’s X-Men, and Liefeld’s dedication to bizarre detail plays well to the strengths of those outfits and the characters themselves. In spite of being a running joke of anatomical issues and miserable guns and costumes, his strengths are played too well here. There are, however, tons of weird moments with items looking like they were drawn separately and slapped in with photoshop, so it’s hard to peg what happened there. Liefeld’s writing is ok, with nothing overly memorable in the dialogue. The running plot of Major X and M’Koy coming back in time to save the future is far from original, but it is executed competently. There is an extended sequence in the future with Major X driving along long expanses of nothing and featureless backgrounds. While there’s a monologue running in the background, it almost feels like someone threw in some pages of Liefeld’s sketchbook to pad the page count. The other artists on this book could very likely be picking up the slack where Liefeld may still have issues. New character M’Koy has large feet for a character known as the Beast, and no efforts were taken to hide any feet in this comic (something Liefeld is notorious for). Adelso Corona and Dan Fraga’s inks blend well with Liefeld’s own, and it looks great. There are some odd color choices, though, with M’Koy’s red fur highlights shaped like suspenders, but Liefeld is known for designs that look entirely bonkers. Finally, there’s the title character himself. Major X’s design is not horrible, but it’s not a fantastic look either. 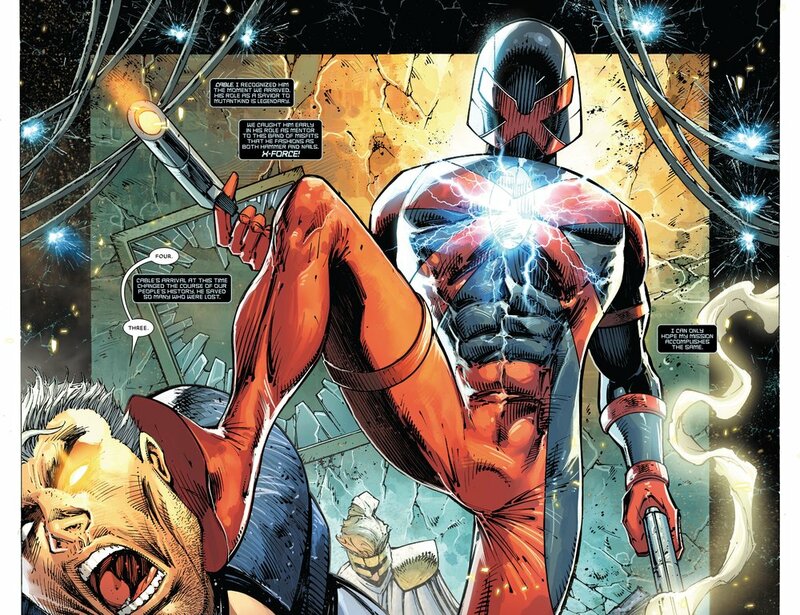 The bodysuit is good and looks like if Deadpool were to redesign his spandex to be an X-Person. The helmet also looks good, like a cross between Judge Dredd’s iconic helmet shape and Cyclops’ recent X-shaped visor-helmet. However, neither seems particularly good together. The helmet belongs on a bulkier character, while the spandex is slimming, and it makes for an odd profile. Ironically, if the costume had more pouches and shoulder pads, it might have worked better. With a cliffhanger right out of one of Liefeld’s last books, it’s hard to say if nostalgia over Rob’s art is going to sell this book alone. His books still sell fantastically, but is Liefeld’s knack for fever dream storytelling and unusual body types enough to sell a book? The random montage of motorcycling aside, the book remains downright enjoyable. However, time will tell if Liefeld can keep up this pace.